We’d love your help. Let us know what’s wrong with this preview of Pseudoscience and the Paranormal by Terence Hines. Television, the movies, and computer games fill the minds of their viewers with a daily staple of fantasy, from tales of UFO landings, haunted houses, and communication with the dead to claims of miraculous cures by gifted healers or breakthrough treatments by means of fringe medicine. The paranormal is so ubiquitous in one form of entertainment or another that many people Television, the movies, and computer games fill the minds of their viewers with a daily staple of fantasy, from tales of UFO landings, haunted houses, and communication with the dead to claims of miraculous cures by gifted healers or breakthrough treatments by means of fringe medicine. The paranormal is so ubiquitous in one form of entertainment or another that many people easily lose sight of the distinction between the real and the imaginary, or they never learn to make the distinction in the first place. 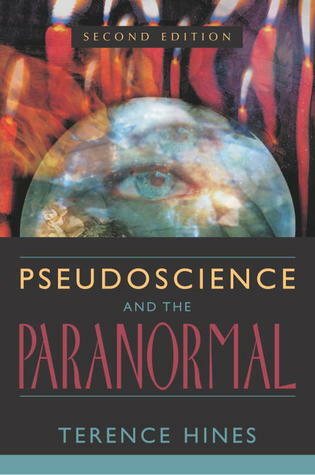 In this thorough review of pseudoscience and the paranormal in contemporary life, psychologist Terence Hines teaches readers how to carefully evaluate all such claims in terms of scientific evidence. Hines devotes separate chapters to psychics; life after death; parapsychology; astrology; UFOs; ancient astronauts, cosmic collisions, and the Bermuda Triangle; faith healing; and more. New to this second edition are extended sections on psychoanalysis and pseudopsychologies, especially recovered memory therapy, satanic ritual abuse, facilitated communication, and other questionable psychotherapies. There are also new chapters on alternative medicine, which is now marketed in our drug stores, and on environmental pseudoscience, with special emphasis on the evidence that certain technologies like cell phones or environmental agents like asbestos cause cancer. To ask other readers questions about Pseudoscience and the Paranormal, please sign up. One of the ultimate "stop having fun guys" books ever. Everyone should be forced to read it until the world understands statistical analysis. This is a must-read for everyone. Fave sections: astrology, homeopathy, and psychoanalysis/jungian pseudo-psychology/humanistic pseudo-psychology. This is THE book that yanked me out of my woo-woo haze and into the wonders of reality. I initially picked it up from the library believing it to be true believer pron but I was blind-sided by reason. I've never been the same, in a good way! Hines' book is a very effective and comprehensive overview of pseudoscience, but compared to some of the other giants of the skeptical field (Park, Randi, Gardner, and the like), it's a bit dry. Excellent. Encyclopedia of irrational beliefs. Well written and well explained. Throughout the whole book the author basically argues against all forms of paranormal phenomena, in the usual materialist fashion.